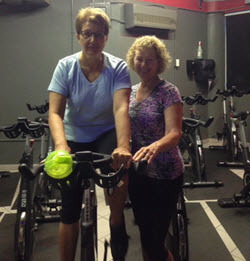 Hi, my name is Kathy Helmuth and I am excited to share a wonderful new program that you can now offer at your club or studio – Parkinson’s Indoor Cycling. 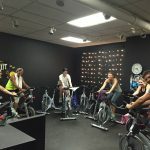 As group cycling instructors, we try to educate and encourage success in our indoor group cycling classes. We see those moments of achievement and we are excited for the participants who have reached their goals. In the Parkinson’s Cycling Coach classes, those moments of achievement are multiplied by 10. Parkinson’s Disease can rob a person of smell, facial expression, movement, and flexibility. Imagine this…. A person with Parkinson’s Disease comes into your indoor cycling class using a cane or a walker. He or she registers for the program, completes the necessary paperwork, and goes through the initial testing. You notice that this individual shows very little expression on their face. After riding a few classes being coached at the proper intensity and cadence, that individual may no longer need a cane or walker. That person is walking with an improved gait and has better balance and flexibility. They have a smile and some expression back on their face! Or imagine this…. a person diagnosed with Parkinson’s Disease not being able to smell the aroma of chocolate chip cookies baking in the oven. After a few Parkinson’s Cycling classes, that individual can now able to smell and taste those delicious cookies. I have really enjoyed the opportunity to help these Parkinson’s individuals feel better and move through their daily activities with greater ease. “Feeling normal” is the way one of our riders describes why she loves this program. 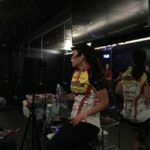 In my interview with Sharon in the video above, she says that the pedaling class makes her “feel normal….like everyone else”. I hope this helps ignite the compassion you have for helping others. Seven to ten million people have been diagnosed with Parkinson’s Disease around the world. Meet Master Parkinson’s Cycling Coach Kathy Helmuth and learn how you can train to become an ACE accredited Parkinson’s Cycling Coach by listening to our announcement podcast below. Do you meet our qualifications to become a Parkinson’s Cycling Coach?